It’s like he’s pointing at himself! In tonight’s ACTION PACKED episode of the OSMcast!. 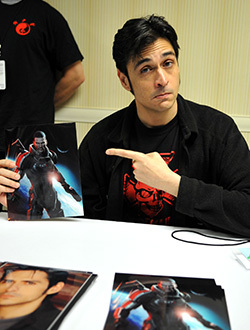 we team up with the Chainsaw Buffet to interview one Mark Meer at Momocon 2013. You probably have heard him giving voice to the male half of everyone’s favorite Commander on the Citadel, Commander Shepard of Mass Effect*. As it turns out, he’s worked with BioWare for much longer than one might be aware! *Not that the OSMcast has liked the Mass Effect series of games or anything. We’d just like to thank Momocon and Mark Meer for letting him chat it up with us, even if all it did was make us wish we could have talked with him more! Also, hey did you see the new website? We have one! It’s looks all NEW. Unless this is your first time, in which case it probably looks all old. Or at least normal, I guess. Either way, welcome! If you haven’t checked us out lately, please peruse our Index of OSM, the archive of all our audio to date. As it turns out we have been running on and on for five years and you tend to accumulate a bunch of stuff in that time! In fact, we are dangerously close to hitting episode 100! If you have any ideas for that, let us know! We’re plumb out.